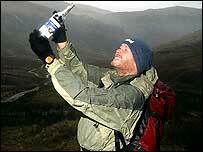 A bottle of "Lakeland air" has sold for £60 on Internet auction website eBay to a mystery buyer from Manchester. Cumbria Tourist Board put the air from the top of Helvellyn for sale to raise funds for conservation projects. It was collected by the fell top assessors who climb Helvellyn every day throughout the winter to check the weather conditions. Bottled air from other parts of the UK is now for sale on the site, including "Manchester Smog" and "Geordie Air". Eric Robson, the chairman of Cumbria Tourist Board, said: "It was bottled at 3,116ft by Pete Collins, the fell top assessor who goes up there every day. "It obviously caught the imagination because for a few days it was the most watched item on eBay with about 6,750 hits. "We're donating the £60 to the Cumbria Lake District Tourism Conservation Partnership, which helps to restore bridges and footpaths. "But the serious point is that the Lake District is a wonderful place for relaxation and unwinding in this glorious fresh air."